One of the more luxurious aspects of Sunelia Perla di Mare, is its space. Our large pitches, set in lush green surroundings, measure approximately 200 m²; these beautiful, private spaces are perfect for sharing fun-filled moments with friends and family. 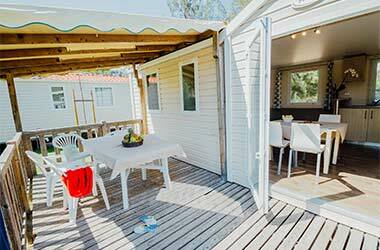 With its range of state-of-the-art mobile homes, Sunelia Perla di Mare is one of the most beautiful campsites on Corsica’s Costa Serena coast. 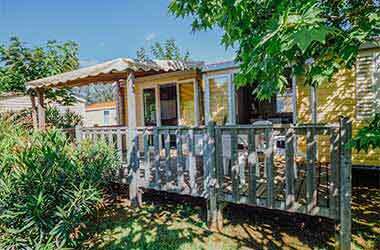 On large plots of 200 m2, the Perla di Mera offers a range of recent mobile homes of different sizes that have as a common point to offer the best benefits of comfort. 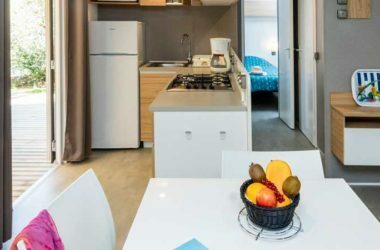 For 4 to 5 people, the Leisure Comfort and Sunêlia Confort mobile homes offer 30 m2 of living space, 2 separate bedrooms, and a covered terrace of 13 m2. The interior is contemporary and the equipment (bedding, air conditioning, cooking appliances, bathroom) high quality. With the Sunêlia Confort Plus, families from 4 to 5 people benefit from accommodation of 32 m2, high-end furniture and a particularly refined decoration. The Sunêlia Prestige is distinguished by a terrace of 18 m2. Mobile homes for 6 people are also available: for large families or groups of friends, they are particularly spacious and functional. Offering 30 to 36 m2 of living space in addition to a large terrace, they are composed of a large living room and 3 bedrooms. The Comfort Plus 6 people also has 2 bathrooms to offer you always more comfort and privacy on vacation. 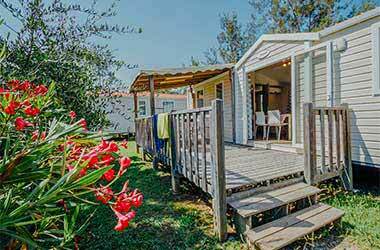 The quality and size of the terraces is one of the many strengths of our range of mobile homes. Because we know that you want to make the most of the Corsican sun and the refreshing life in the fresh air, we put at your disposal rental facilities with large wooden terraces and tastefully furnished. 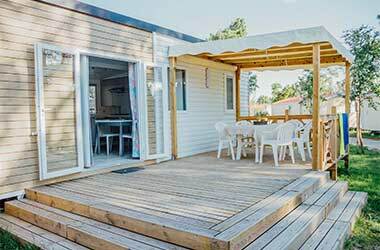 The mobile homes of the Confort and Confort Plus range have a terrace of 13 m2, ideal for al fresco dining with family or friends or lounging on a deckchair. 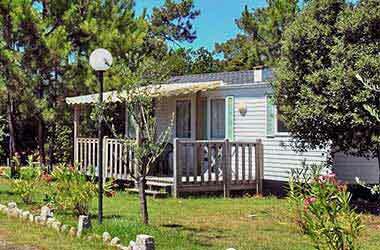 In Prestige mobile homes, the private outdoor area is 18 m2: a real luxury for holidays in Corsica. Covered or partly covered, the terrace of your vacation rental on the Costa Serena is a shady woodland perfect for relaxation and rejuvenation. The landscape of Perla di Mare is a nice added value for your terrace. Outdoor enthusiasts will be satisfied. Enjoy a comfortable stay without giving up the pleasures of the great outdoors! On your terrace, all your meals can be taken outside. A complete garden furniture team of course each housing, in addition to the interior furniture.